This Ridgewood, New Jersey, pool won a Gold Medal in the category of “Specialty Pools: Negative Edge” in NESPA’s 2015 Outstanding Achievement Awards competition last October. The design build company for the project was Thomas Flint Landscaping Design & Development LLC, Midland Park, New Jersey. After company owner Thomas Flint graduated with a bachelor’s degree in landscape design, development and ornamental horticulture, he launched his company in 2003,focusing on landscape construction, masonry and pool renovations. 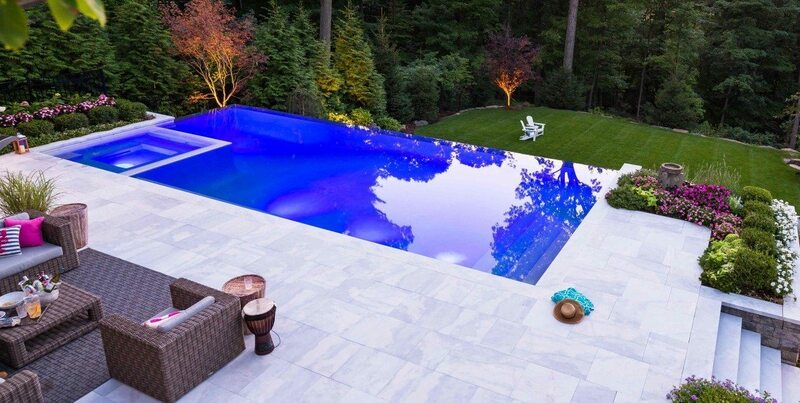 When he started the company, he said that many pool builders in his area did not take the entire backyard environment into consideration when building a new pool. Instead, he saw many examples of new pools being designed and constructed with patios and landscaping that looked like they were added as an afterthought. In 2011, encouraged by his current clients who wanted him to build their new pools, Flint added pool design and construction to his company’s offerings with the goal of creating unique backyard environments where the pool is central to the client’s lifestyle and its aesthetic presence is just as much a factor as its function. From the time that he started the business to the present, Flint has successfully relied on word-of-mouth advertising for new pool business. Occasionally, he will run an ad in high-end magazines.